State police are investigating after finding the body of a baby in a bag in a city of Bristol reservoir in Harwinton. 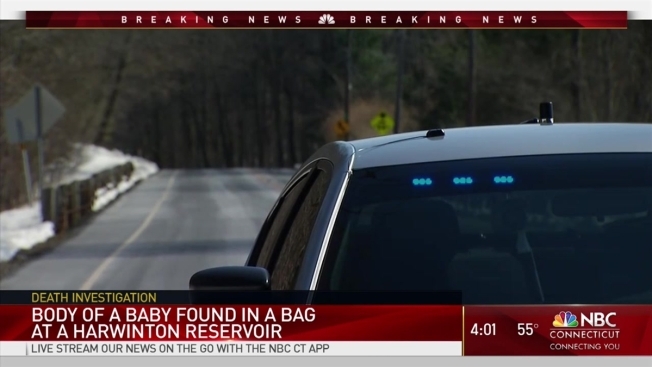 State police were notified at 10:40 a.m. today after workers at Bristol Reservoir #4 found a dead baby in a bag along Route 72 and Route 4 in Harwinton. State police said the baby was found by workers at the reservoir. Detectives from Western District Major Crime responded to the scene and will assume the investigation and the Office of Chief Medical Examiner will conduct a post-mortem examination to determine cause and manner of death. The City of Bristol Water Department maintains the reservoir and has consulted with the Connecticut Department of Health. A state police dive team will conduct a search for possible evidence. Police said the reservoir has not been used in a few days and will remain offline. "On behalf of the Bristol Water Department I would like to assure all of our customers that the water in Bristol is completely safe. The reservoir where this unfortunate event occurred has been off line for the past few days due to the drought and will remain off line. We have been in consultation with the Department of Public Health and local Health Director through out the day. We are confident that the drinking water is completely safe in the City of Bristol," Robert Longo, superintendent of the Bristol Water Department, said in a statement on the Bristol Water Department website.